Today was the deadline for the Wester Derry Wind Co-op share offer. We have reached the sum of approximately £505,000, which is 63% of the total. Some very good news -we have been in discussions with organisations which are prepared to buy up any shares remaining, so the co-op will now definitely go ahead. All existing applicants will get the full share allocation applied for. In order to give a last opportunity for members of the public to join the co-op, we will be extending the share offer by a further 2 weeks. It will now end on 15 August but will not be further extended. This means that we can get on with the building and installation of the turbine while the weather is still good. If you would like to join our 120 members then this is your last opportunity! Our co-op is now listed on Ethex, the UK’s first not-for-profit positive investment website. It’s another string to our bow alongside the more traditional methods of application- and means you can join the co-op and pay online without filling in a paper application. Wester Derry Wind Co-op was mentioned in a great article in the Guardian on Saturday…great to be recognised as pioneers on the UK stage. In the meanwhile we are at the Alyth show – we’re very keen to attract members from both near and far to help us get to our target. Although we received a lot of applications in the last 2 weeks and got to the respectable sum of £339,050 we did not reach our £800,000 target by the intended end date so we are extending the share offer until 31 July (as provided for in the share offer document). We are supporting the extension with a new marketing campaign (and budget) – expect to see us at shows and other events and in the press soon. All existing share applications remain valid of course. This extension does not affect the timescale for the turbine erection – the turbine is being built as we speak and will be ready for Autumn installation. We know a lot of people are waiting to see if the project is really going ahead before investing – over 500 share offers have been downloaded and another 500 hard copies given out locally. So we’d like everyone to know that we are serious, we have put a £150,000 downpayment on the turbine, the project is definitely going ahead – please join us! We’re very pleased to say that we have now ordered our turbine from WTN and paid a sizeable deposit so that manufacture can start at their factory in Germany. This was possible because all the Pioneer shares have now been allocated – many thanks to our pioneer members who will be receiving their share certificates shortly. All in all we have sold just over 200,000 shares to date, with applications now starting to come in thick and fast as the deadline looms – just 2 weeks to go! EIS tax relief at 30% is still available – invest £1000 and in the case of most taxpayers you get £300 back from the taxman – and keep your 1000 shares. 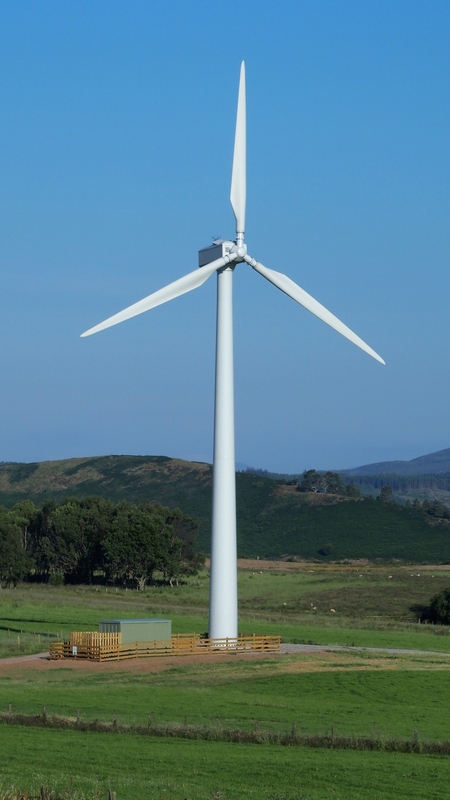 Meanwhile our friends at Dingwall are in the throes of installing their turbine – the same WN 250 model as ours – it ought to be spinning in a matter of days, if the rain and wind will just hold off a little! We’ve now announced our next local drop-in session: Thrums Hotel, Kirriemuir. 31 May, 11-2. This will likely be the final local drop-in before the share offer end date of 9 June 2014. Our drop-in session on 10 May in Alyth was a great success. Lots of people dropped by to ask us searching questions – looks like we managed to answer them as we sold several thousand pounds worth of shares to local people on the day! We’re very happy to announce that we have finalised the destination of our community fund. The CARES Community Benefit Fund of £2,500 annually is going to Alyth Primary School Parent Staff Association and the additional element of Community Benefit (estimated at £2,000 in year 1) to Isla Primary School Fundraising Committee. We’re delighted that the Fund will be going toward the education of local children. At an estimated total of £4,500/yr it is proportionately much larger than funds from commercial windfarms and an important part of our commitment to co-operative principles. There’s another chance for local people to meet the co-op founders and ask any questions about becoming a member of the co-op at our drop-in session, which will be held at the Alyth Hotel on 10 May from 10-2. We’ll be there to answer any questions you may have about the turbine, investment, tax reliefs or us! Map of Alyth Hotel location. Wester Derry Wind Co-operative is a Registered Society registered with the Financial Conduct Authority No. 2785RS. For more information email info@westerderrywind.org.uk or call Sharenergy on 01743 277119.